I’ve been playing through Deadly Premonition and Binary Domain on Kotaku’s Twitch channel. One is an offbeat crime thriller and the other is a clumsy shooter about robots. They’re pure pulp. They’re also two of the best games I’ve ever played. Deadly Premonition and Binary Domain lack the refined technical polish or (supposedly) mature sensibilities of acclaimed games like The Last of Us, but they make up for it with their unabashed authenticity. They embrace their technical limitations and lean into their ridiculous premises. This gives them both strong identities that other games lack. Deadly Premonition is a strong case study in authentic design. Released in 2010, the project was led by Hidetaka “SWERY” Suehiro. Set in the town of Greenvale after the murder of a young girl, players follow eccentric FBI agent Francis York Morgan as he investigates the killing. Deadly Premonition is many things at once. It’s a loving tribute to Twin Peaks that recreates the show’s affection for the Pacific Northwest. It’s an offbrand horror game with dark forests full of spectral creatures and haunting animations. It’s a robust immersive game ala Shenmue where characters embark on day to day routines. It is also a great big mess. York controls with a slight delay, and strange button mapping turns gunplay into a confusing affair. The world is too large, full of empty space and excess travel time. The narrative leaps from dark scenes detailing brutal murder to quirky lunchroom conversations about obscure movies. The music is disjointed, packed with oppressive piano pieces as well as bouncy whistling. Deadly Premonition tries to weave quirky character interaction with gritty crime procedural and magical realist spectacle. It mashes its gunplay in between side questing that feels more like Harvest Moon than anything else. Deadly Premonition turns the pedestrian day to day lives of its NPCs into whimsical displays of affecting Americana while also promising danger and magic off the beaten path. None of it truly works and yet, every moment of it intrigues and delights. 2012’s Binary Domain exhibits similar sensibilities. Like Deadly Premonition, the gameplay is also a weave of multiple systems that don’t always coalesce. Functionally, it’s a cover shooter when players guide their character through massive gun battles against waves of robots. On top of this, the game adds voice recognition to communicate with teammates as well as a trust system for gaining their approval. 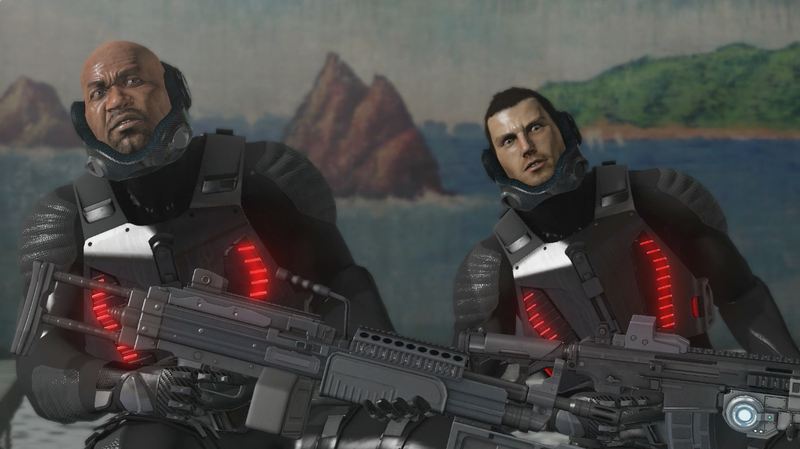 Binary Domain has a little bit of everything. It blends the gruff shooting of Gears of War with the tactical aspirations of SOCOM while sprinkling in Mass Effect character dynamics. It’s a haphazard design philosophy that never really manages to meet the raw polish of any of the games that inspired it. What makes Binary Domain work is a willingness to embrace imperfections and lean heavily into pulp cliches. The story focuses on a team of special forces operatives sent to deal with rogue robots in Japan. These robots, called “Hollow Children,” can pass for humans. They live among the populace unaware of their true nature. It’s a well-worn conceit that Binary Domain tackles with earnestness. This is a game that wants to explore themes of the soul but is comfortable placing that between hackneyed romantic cliches, gruff military jargon, and heavy-handed exposition. Shying away from subtlety, it embraces cyberpunk and science fiction cliches to create an engaging pulp melodrama. The above scene shows what happens with a Hollow Child is found in the slums of Japan. It’s violent and loud, with vocal performances worthy of a soap opera. As we watch the Hollow Child realize their true nature and gaze with horror at their violent demise, Binary Domain doesn’t just reveal its pulp sensibility; it weaponizes it to turn the moment into a bitesized tragedy of Sophoclean richness. It’s loud and cliched, but affecting. These games succeed explicitly because of their roughness and lack of polish. Deadly Premonition’s affecting hodge-podge of tone would disappear if the developers added higher quality animations or a more consistent musical score. Binary Domain would crumble from the introduction of subtle writing or refined vocal performance. They are rough pieces of pulp schlock and all the better for it.